The artichoke can scare off even the most seasoned culinary pro. Its daunting appearance and confusing composition can leave many people uninterested in tackling it as a culinary craft. However, there are many healthy artichoke recipes that you can try that are simple and easy that won’t leave you over intimidated by this popular produce and missing out on the benefits of a cholesterol lowering diet containing artichokes. If you are anxious to get in on artichoke benefits, but don’t quite know where to begin, you can start by checking out our picks for 5 healthy artichoke recipes! 1. Looking for baby artichoke recipes? One very simple idea is a simple preparation method that adds big flavor. Add artichokes in a steaming basket to a few inches of water that contains a clove of garlic, lemon slice and bay leaf. Cook for 25-45 minutes depending on size and enjoy! 2. Another simple preparation that is low in difficulty but high in flavor is to simply play off of the gentle sweetness of the artichoke that is the reason behind artichoke leaf extract actually being used as a sweetener! To benefit from this flavor maximizer, fill a pan with enough water to cover the bottom and boil over high heat. Meanwhile, remove the stems and outer tough leaves of the artichokes and stick butter pieces and garlic in between the leaves. Steam in a basket over the boiling water until tender or about 20 minutes. 3. Want a salad but don’t know any healthy artichoke recipes? Try this: Remove the outer leaves of the artichoke and remove the top third of the bud. Squeeze a lemon into a bowl of cold water and place artichokes inside. Drain them and dry them and cut them into thin slices and move to a bowl where you will squeeze fresh lemon over them and 4 tbsp extra virgin olive oil and toss to coat. Add ½ cup baby arugula and ¼ cup of mint leaves that have been torn and season with salt and pepper. Sprinkle parmesan shavings to finish. 4. 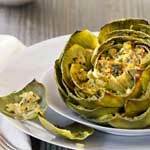 Looking for a heartier option amongst healthy artichoke recipes? Try this crostini recipe! Drizzle ciabatta bread, ½ inch thick slices, with olive oil and char over a charcoal or gas grill for 4-5 minutes. Rub the hot bread with garlic and spread 1 tbsp. of mascarpone cheese on each piece. Top all with marinated artichoke hearts and chives, parmesan cheese and pepper. 5. In need of marinated artichoke hearts for the crostini recipe above? Well you’re in luck! Rinse frozen hearts under cold water and add the hearts along with ½ cup extra virgin olive oil, a teaspoon of kosher salt, ½ tsp. of thyme ½ tsp. of oregano and ¼ tsp. crushed chili flakes into a saucepan over medium to low heat for about 10 minutes.